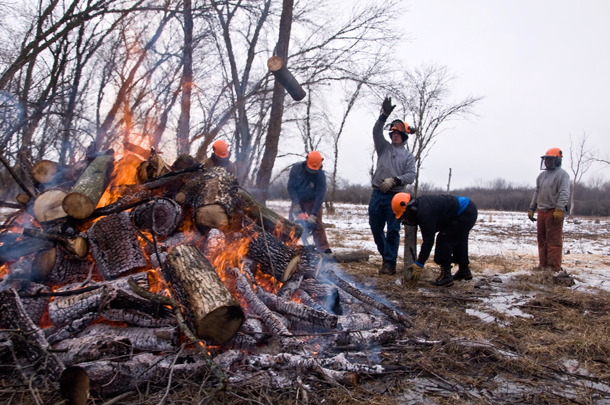 Members of the Calumet Invasive Species Conservation Corps toss sections of felled tress onto a fire in Kickapoo Woods. Brenda Elmore grew up in West Pullman, literally a stone’s throw from the Whistler Preserve in Riverdale, Ill. Even though she has always lived within walking distance of some of the Forest Preserve District of Cook County’s largest holdings, she learned from a young age to stay away from them. “I used to be scared to come anywhere near it,” Elmore said. She says her parents told her that Jason, the machete-wielding killer from the Friday the 13th movies, lived in the Forest Preserves. In reality, they were worried about gangs. The far south side forest preserves’ seclusion and proximity to areas troubled by gang activity made them ideal dumping grounds for bodies. And a dense underbrush of white poplar, buckthorn and purple loosestrife — all invasive species — obscured any view of the interior from the road. As she cuts back invasive species with a chainsaw in Kickapoo Woods, it’s clear Elmore, 50, has come a long way — and so have the Forest Preserves. She is part of the Calumet Invasive Species Conservation Corps, an EPA-funded program that hired workers from underrepresented areas of Chicago to restore at least 228 acres of wetland and wet prairieland in the Calumet region. Friends of the Forest Preserves co-administers the $518,467 federal grant, which is part of the Great Lakes Restoration Initiative, with the Student Conservation Association. Prairie restoration in the Calumet, as in many places, is largely about clearing invasives that have choked out native species by blocking all the light. Dozens of species of bygone prairie grasses still have seeds lying dormant in the soil, and could take off once again if conservationists can help them establish a foothold. A five-person crew hacked at ash trees and white poplars Monday, nearly one and a half years into their two-year stint with the program. Aerial photographs from 2007 and 2011 show how much progress they, along with volunteer groups and contractors, have made. A construction of sandhill cranes flies overhead. They are migrating and looking for somewhere to stop off. Kickapoo probably doesn’t have enough water to attract them, Mann says, but as biodiversity returns to the site it is likely to sustain species the area&apos;s stewards would have been lucky to spot decades ago. For Mann, who came to this line of work from real estate and then plumbing, restoration is also about self-discovery. It is a similar story for Elmore. “I didn’t realize I liked being outside as much as I do,” she says. At first Green Corps was “just a job” for her, she says, but she soon realized she liked the work. After the Calumet Invasive Species Conservation Corps program is complete, Elmore hopes to land a job that will keep her outside, working with nature.